The GTO underwent a complete styling update for the 1968 model year with smoother rounded edges replacing the sharp corners of previous generations. 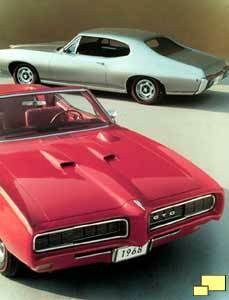 The big news was the body colored "Endura" bumpers, which were highly dent resistant and ahead of their time. Vacuum assisted hidden headlights were an option. Engine choices were essentially the same, with an improved Ram Air II making a debut in March 1968. Used a paper air filter on the carburetor and a dealer installed option made the hood scoops functional. 0 to 60 mph . . . . 6.5 sec. 0 to 60 mph . . . . 7.3 sec. 0 to 60 mph . . . . 6.6 sec.